Philly-Rochester and back is six hours each way. That’s a lot of CD’s. I’m reminded of what a huge state Pennsylvania is and how many towns I don’t know and don’t want to even though many of them are much prettier than Philadelphia. Musically, Andy and I can agree that we both like English men from the 80s who feel sorry for themselves. I’m kinder to sad-sack 90s dudes. We both hate crybabies of this decade. Peter Gabriel – 3 (a.k.a Melting Face) Andy’s purchase. It reminded me of my druggy, proggy high school past, and did you know that Paul Weller and XTC’s Dave Gregory played on it? Breakfast Club London – Promo from work. Good nighttime driving music. Brasil 2Mil: Soul of Bossanova – Ditto. Summer Beach Party: Songs from the Classic Beach Movies of the ’60s (I need to hear more Donna Loren). Judas Priest – British Steel (Andy’s). We love to point out all of Rob Halford’s pounding metaphors and wondered why no one knew he was gay back then. We wondered if his bandmates knew or if he was sleeping with any of them. We decided that on the band’s nights off, they are so sick of each other that RH probably steeled away to some bath houses. Goldfrapp – Supernature (One of my fave CD’s of last year. It’s made for driving). 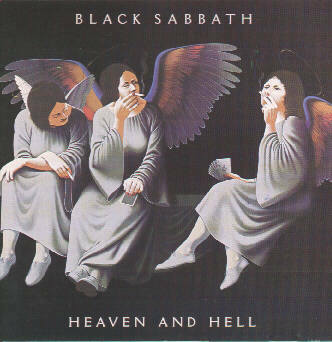 Black Sabbath – Heaven and Hell (Without Andy, I would never know what Ronnie James Dio-era BS sounds like. When I was a kid, all BS album covers used to scare me). The Who – Endless Wire (Andy’s choice. He likes this one more than I do. I wanted to like it more). Once we were in Rochester, we listened to a lot of college radio, like WBER, where Andy worked when he lived there. There are two others, one of them donates an hour or two a day to high school kids, which is when I heard The Pixies’ “Caribou” and it made me really happy. Entry filed under: Andy The Boyfriend, Uncategorized. Rochester: Last Day	Who Is This Turd, Anyway? i have the donna loren collection called beach blanket bingo, but only because it’s axelrod produced. i mean, it’s good, but i wouldn’t have sought it out otherwise. i think a lot of people feel he didn’t do her voice justice. and just to be pedantic: there’s no apostrophe in the r.e.m. album title. they’re very insistent about that shizz.